In going through the UFO files within the Canadian National Archives, I came across a curious briefing document that had been prepared in November 1967 to give an overview of the status of the UFO phenomenon in Canada. It had been created, with accompanying slides, by Wing Commander D.F. (Douglas Furg) Robertson of the Canadian Forces, possibly to bring the new Minister of Defence up to date (the infamous Paul Hellyer had left the position a few months earlier). But the Briefing was more designed to help alleviate the burden of dealing with UFOs by the Canadian Department of National Defence (DND). On the first page, Roberson defines a UFO as "an unusual aerial sighting which the observer is unable to identify or explain." This definition is at odds with more refined versions that place some responsibility on the investigator rather than the observer. But if someone sees something he or she can't explain, it's a UFO, at least to the Canadian Forces. At the top of page 2, it is noted there was an actual Administrative Order, CFAO 71-6, which specifically instructs the Director of Operations (DOps) to investigate UFO reports. On page 3, a reiteration that the USAF UFO investigation group found no evidence that UFOs "constitute a direct physical threat to the security of the USA." Further, that UFOs should be "stripped" of their mystery. 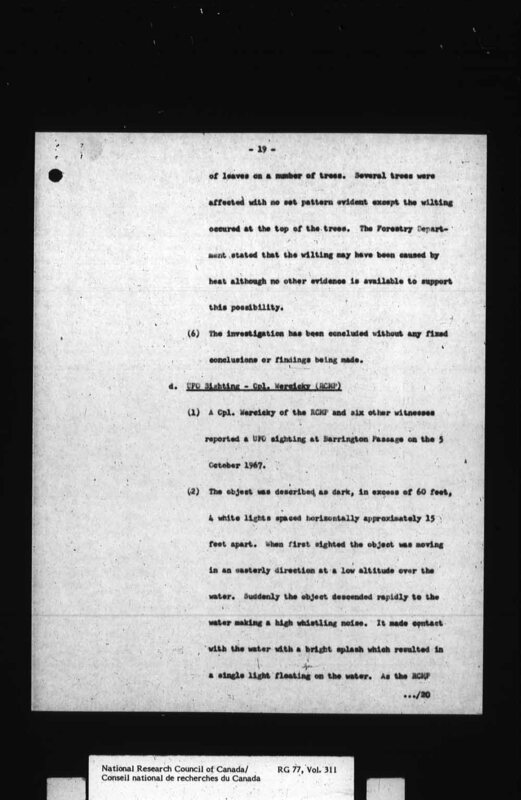 Roberston then noted that in about 1960, the National Research Council of Canada (NRC) established a scientific committee to study fireballs and meteors, but carefully noted the committee is interested in optical observations of astronomical events and not "the scientific evaluation of unusual aerial sightings." 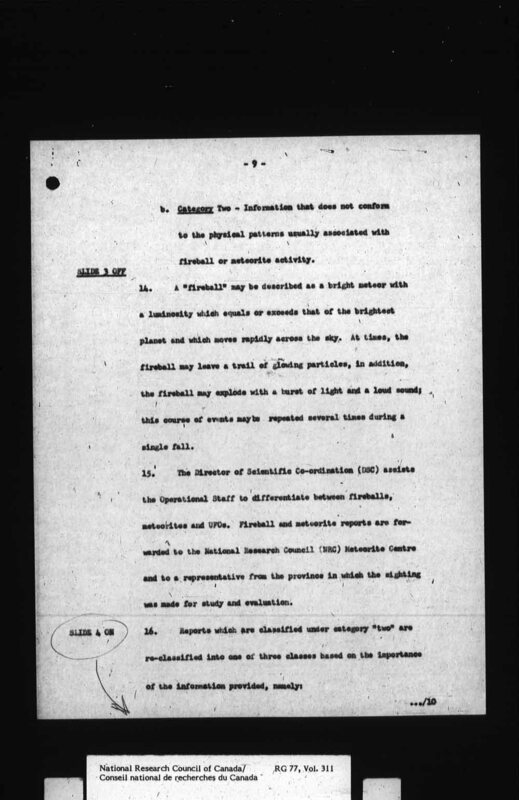 So the NRC may have been receiving UFO reports, but its mandate was in scientific assessment of meteors. 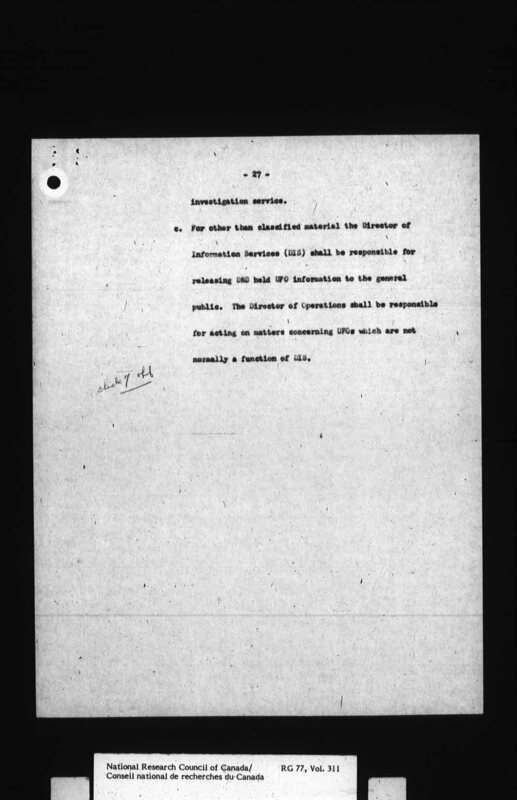 UFO reports referred to the Department of National Defence (DND) were forwarded to Air Defence Command (ADC) for investigation. Furthermore, ADC and its partner North American Air Defense (NORAD) were "most interested in aerial objects which could not be properly identified." 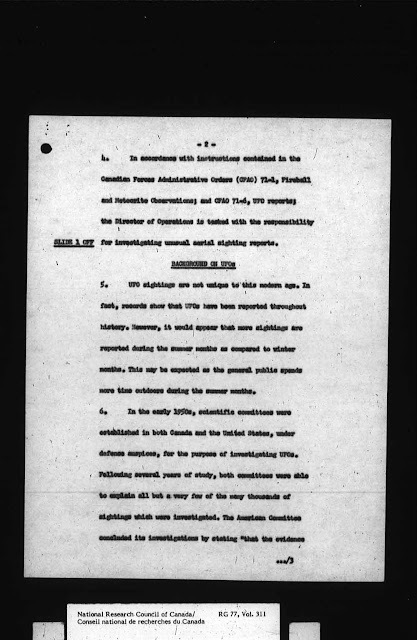 But as most UFO reports were explainable and were not considered threats to the nation, responsibility for UFO investigations was transferred to Canadian Forces Headquarters (CFHQ). Then, the Director of Intelligence coordinated UFO investigations. 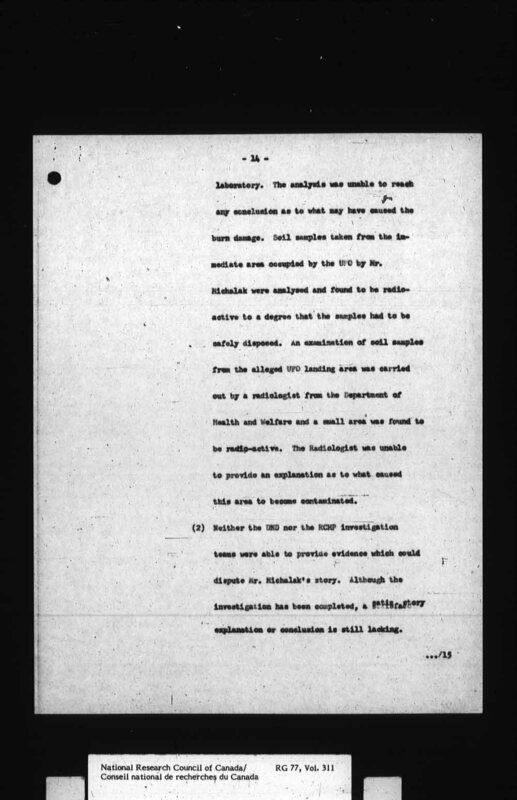 Roberston identified Dr. J.C. Arnell, the Scientific Deputy Chief of Technical Services, as someone who "was an active an interested participant in dealing with UFO matters." 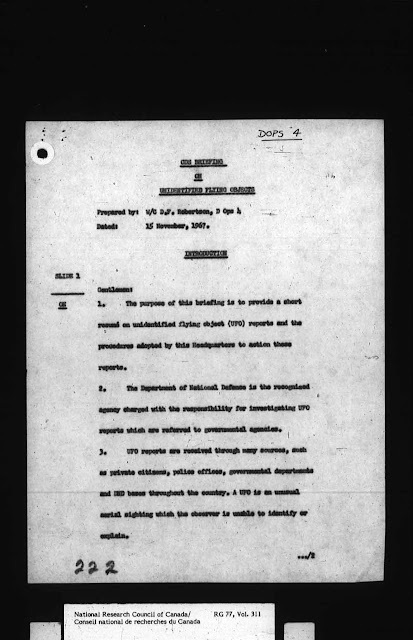 Then, in the spring of 1966, UFO investigations became the duty of the Director of Operations (DOps). 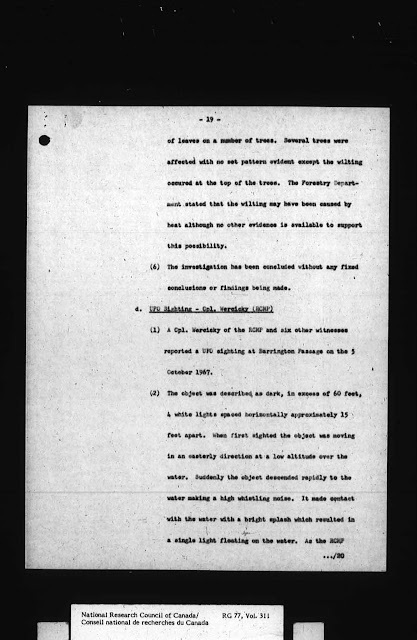 Page 5 is a description of Project Blue Book and the Colorado Committee. On page 6, Roberston tells his committee that some civilian groups are investigating UFOs and that some "distinguished and prominent citizens," many of whom are "exceptionally well qualified," are studying UFO reports. He mentions Dr. James McDonald specifically, noting his evaluations of "credible reports of low-level, close-range sightings of machine-like objects." Page 7: the seven categories of UFOs: hoaxes, hallucinations, misidentifications, military vehicles, natural electromagnetic phenomena, psychological phenomena, ...and UFOs! Page 8 notes that "the University of Toronto will undertake a serious scientific review" of UFOs. This was based out of the U of T Institute for Aerospace Studies, which had a subcommittee of UFOs meet regularly in the 1960s and early 1970s. Curiously the Institute's current website has no hint of any association with UFO research, and a search of its site for anything related to UFOs produces no results at all. 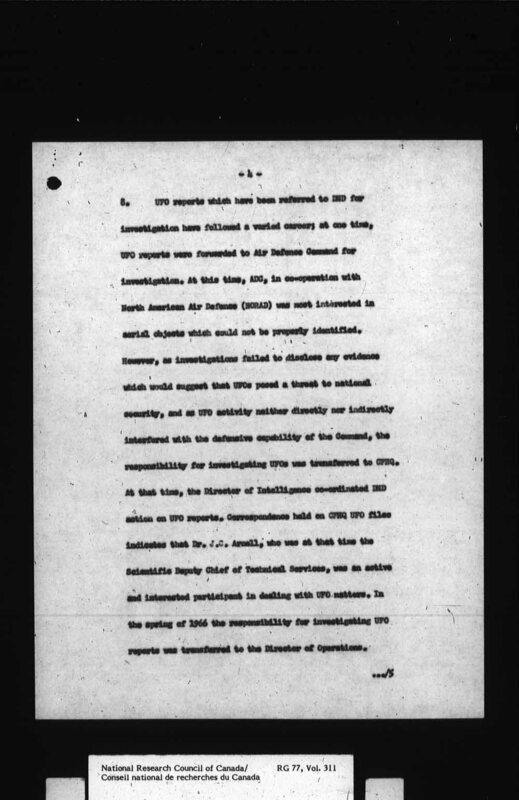 This, despite the fact that the UTIAS reports on UFOs were at one time searchable online. Also on this page, Roberston detailed the CFHQ procedure for investigating UFO reports. First, Operations Staff had to decide whether the report was of a fireball or meteor, or something else. These were classified into three classes: Class A cases warranted a formal investigation; Class B were "interesting," but didn't need investigation; and Class C were of "little practical value," so no investigation was required. A logical question is: if Class B were interesting, why wouldn't they be investigated? 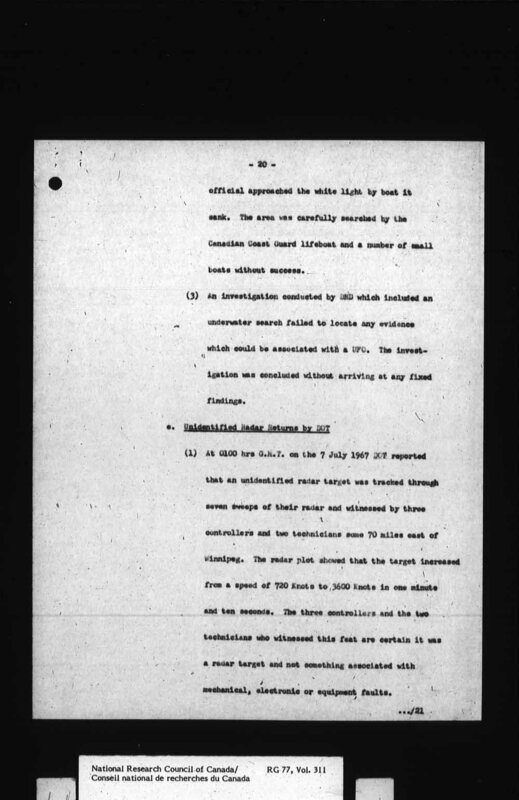 On page 10, Robertson notes that prior to 1966, DND was getting about 40 UFO reports each year. But in 1967, the number jumped to 167. In fact, a higher number was crossed out: 193 reports as of mid-November 1967. That would mean a five-fold increase from 1966 to 1967. It is not clear why the numbers were revised lower for the briefing document. 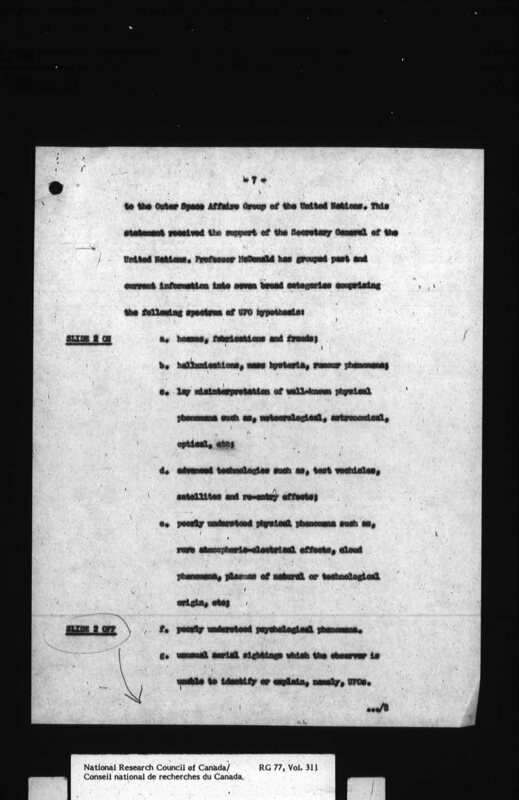 Not only that, but Robertson notes that the 167 (or 193) does not include reports explained as meteors or fireballs. That means the 167 (or 193) are already minus misidentified IFOs and reports that were otherwise explained; but these were not the Class C cases. 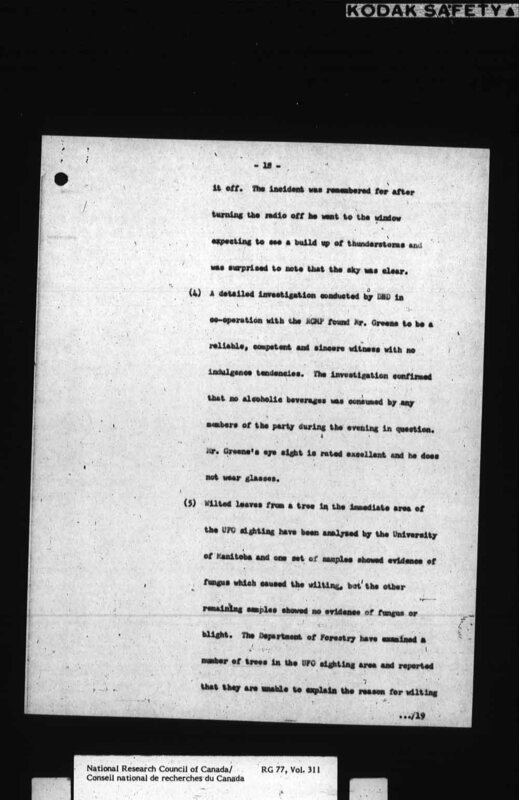 Roberston notes there were 8 (or 9) Class A cases in 1967, and 21 (or 23) Class B cases. He notes: "the remainder classified under Class 'C.'" 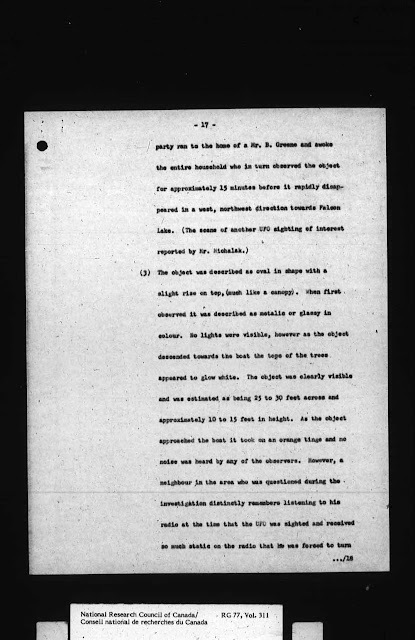 So fireball reports were not part of the UFO report collection. On page 11, the nature of UFO investigation is detailed. 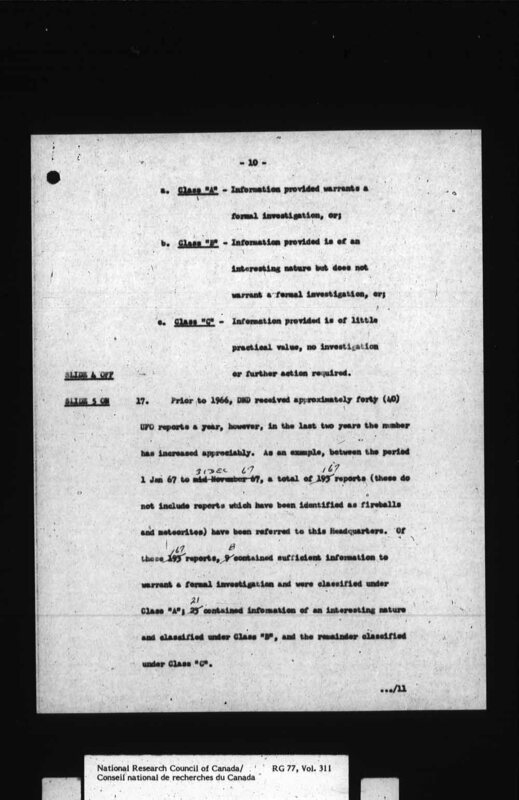 Formal investigations may be as simple as an interview of a witness by an investigator, or as complex as involving other agencies such as the RCMP, NRC, Defence Research Board (DRB) or the Department of National Health and Welfare. The last agency is a bit puzzling. What aspects of a UFO report would require investigation by an agency interested in health? Robertson attempted to plot the UFOs reported in 1967 on a map of Canada to see if there was some kind of obvious geographical distribution. There wasn't, and his attempts to draw relationships or see patterns between location, time, description, movement and other factors all failed as well, except one: "a small relationship in the size of the UFO contained in a number of reports." But what this means is anyone's guess. Here is the most interesting part of Roberston's briefing. He notes that of the 29 (or 32) cases in 1967 that were either Class A or Class B, six were worthy of discussion in the briefing. The first was the Falcon Lake case, involving the physical effects of a UFO on Stefan Michalak on May 20, 1967. Roberston's review of the Falcon Lake case included the note that the RCMP Crime Laboratory was "unable to reach any conclusion as to what may have caused the burn damage" to Michalak's clothing. Soil samples from the site "were analysed and found to be radioactive to a degree that the samples had to be safely disposed." 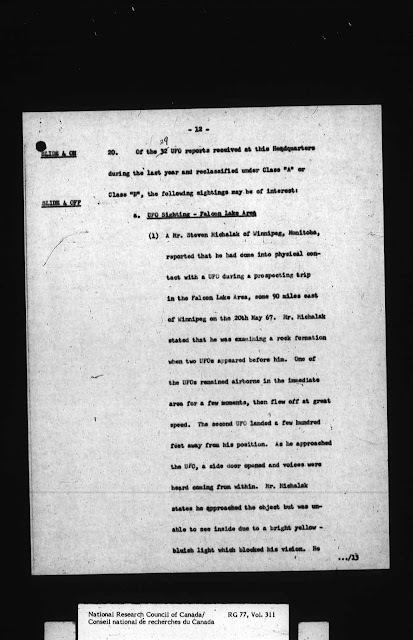 Here is the earliest confirmed instance of a UFO case where radiation was associated with a UFO landing. And the radiation level was so high, the samples were deemed dangerous! 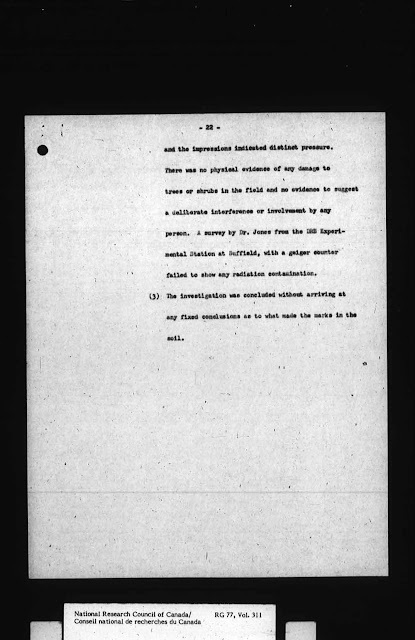 A radiologist from the Department of Health and Welfare (this is why that department had been named) "was unable to provide an explanation as to what caused the area to become contaminated." Finally, the kicker: "Neither the DND nor the RCMP investigation teams were able to provide evidence which could dispute Mr. Michalak's story. Although the investigation has been completed, a satisfactory explanation or conclusion is still lacking." There you have it: Military and police investigators could not explain the case. 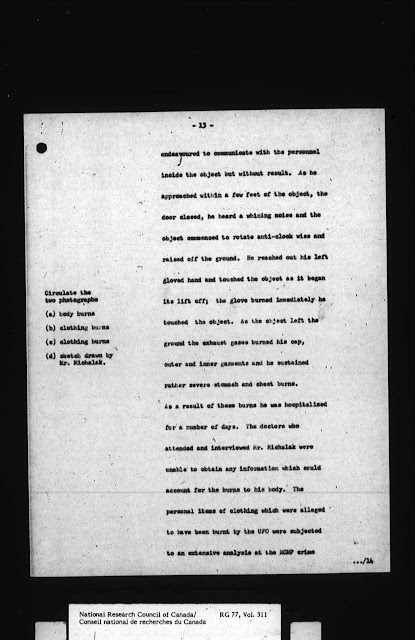 The second case included in the briefing was the "Warren Smith photos" from July 3, 1967. A three witness case, Smith took two photos of a saucer-shaped object flying over some trees while in the Rocky Mountain foothills 30 miles west of Calgary near Nanton, Alberta. The Canadian Forces' Photo Intelligence Interpretation Centre concluded: "assuming the photograph to be genuine, the UFO fitted the description of the object reported by Mr. Smith." That weaselly statement didn't say it was unexplained, only that it looked like a UFO. Next up was a strange sighting that took place on June 18, 1967, at Clearwater Bay, on Shoal Lake in Ontario. What isn't obvious to the casual reader is that Clearwater Bay is barely 30 kilometres (less than 20 miles!) from where Stefan Michalak was burned by a UFO less than a month earlier. What's more, this case also involved physical evidence. At about 10:30 pm, Mr. Greene and his family were in a boat on Shoal Lake, heading for Clearwater Ba,y when they saw a domed, disc-shaped object moving above the trees on shore, about a mile away (the original report said 1/4 mile away). Greene decided to turn the boat towards the craft to get a better view. The object seemed metallic, about 25 to 30 feet across and about 10 to 15 feet thick. (In other words, almost exactly the same dimensions and appearance as the Falcon Lake object.) But as he approached, the object suddenly dropped down and approached their boat at high speed. Greene and his passengers were scared, and so he turned around and headed to the opposite shore, where they got out of the boat. But the playful object moved back to its original position so they got back in the boat and tried to get near it again. It came towards them again so they beat a hasty retreat. They woke up some neighbours (who were relatives and also named Greene), then they all watched the object as it hovered for 15 minutes in the west before it flew away in that direction. As for physical effects, another relative who lived 1/4 mile from where the object had hovered was listening to his transistor radio at the time and found it was overwhelmed by static. An investigation carried out by RCMP and DND found a freshly fallen tree near where the craft hovered, as well as a strange wilting of leaves in the treetops. Leaves from the affected area were analysed and showed "no evidence of fungus or blight." The investigation of the Clearwater Bay case was "concluded without any fixed conclusions or findings being made." The fourth case was the notable Shag Harbour UFO "crash" of October 5, 1967. The case was given only a very brief treatment by Roberston, although he noted it was described as a "dark" object, 60 feet wide with 4 white lights, and moving low over the water before it descended rapidly to the water making a whistling noise. It made a big splash when it hit the ocean, and a single light floated for a while, then went out. RCMP Corporal Wercicky was said to be one witness. 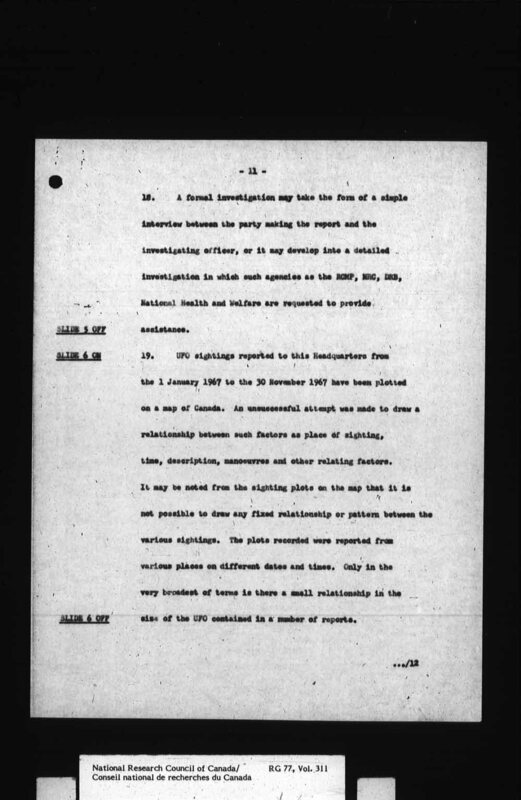 Robertson noted: "An investigation conducted by DND which included an underwater search failed to locate any evidence which could be associated with a UFO. The investigation was concluded without arriving at any fixed findings." What does that mean? No evidence that could be "associated" with a UFO? Like what? And there were no "fixed findings?" Does that mean it was unexplained? But page 20 also includes something rather remarkable: a radar case. On July 6, 1967, at about 7:00 pm, three air traffic controllers and two radar technicians all witnessed "an unidentified radar target" tracked through seven sweeps. And where did this take place? According to Robertson, it was "some 70 miles east of Winnipeg." That's almost exactly at Falcon Lake. Again. Very close to Clearwater Bay, too. It's possible that Robertson had the location a bit off, as the USAF radar base in Canada was actually located near Milner Ridge, Manitoba, about 50 kilometres (30 miles) northeast of Winnipeg. At any rate, the object tracked on radar sped up from 720 knots to 3600 knots in 70 seconds, an amazing acceleration. Roberston noted the witnesses were "certain it was a radar target and not something associated with mechanical, electronic or equipment faults." 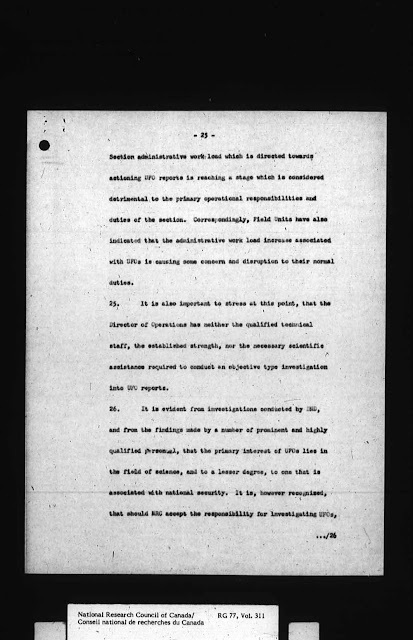 But not to be outdone, page 21 of Robertson's briefing listed another radar case that occurred only a few hours later. At 9:24 pm on July 6, 1967, radar operators at Kenora airport followed an unknown object for at least 29 minutes, deeming it a "positive radar contact." The object followed Air Canada airlines Flight 405 for a while then disappeared from the scope. It reappeared and followed another Air Canada plane, Flight 927, for a while. Roberston noted: "DOT (Department of Transport) are unable to explain these radar returns." NB: Kenora is only 30 kilometres (about 20 miles) away from Clearwater Bay. Finally, Robertson's sixth case was practically mentioned only as an afterthought, even though it represented a new phenomenon: crop circles. Yes, the first crop formations were not found in Britain as is usually believed, but in Canada, on August 6, 1967, near Camrose, Alberta. 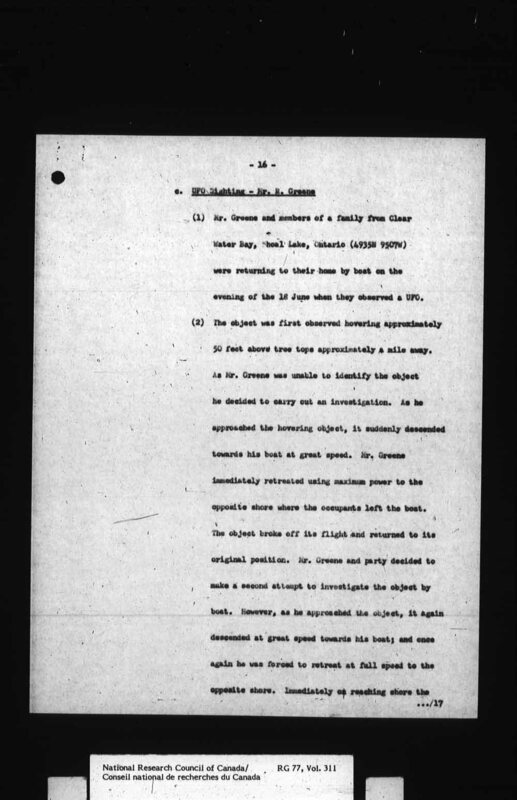 As Robertson noted: "An investigation conducted by DND substantiated that an unknown object or objects had left six, six-inch width, 31 to 36 diameter circles in the soil... and the impressions indicated distinct pressure. There was no physical evidence of any damage to trees or shrubs in the field and no evidence to suggest a deliberate interference or involvement by any person." Therefore, the first crop circles found in North America were investigated by the Canadian Armed Forces. Also, there was no associated sighting of a UFO, yet this was included in a briefing on UFOs for the Canadian military. 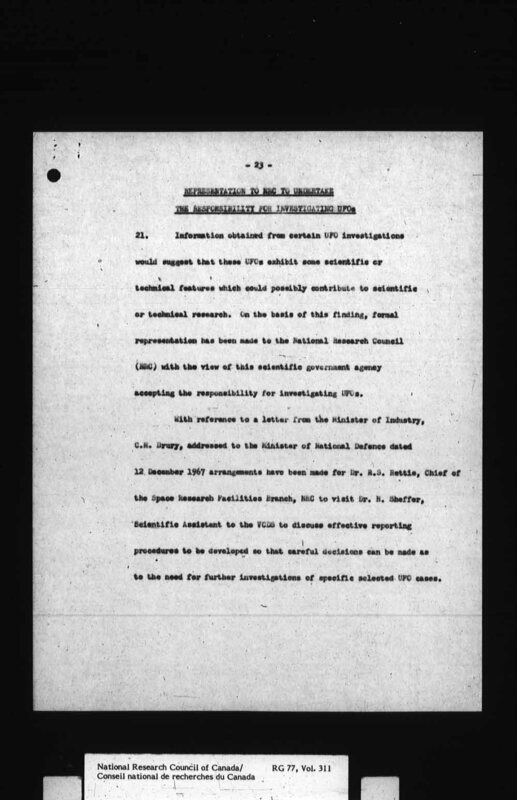 On page 23, DND made a case for shuffling the UFO problem off to the NRC. It made sense, because the NRC was the main scientific body in Canada, and UFOs seemed to be a scientific issue. Page 24 addressed the topic of secrecy and classification of material related to UFOs. This was because the public was demanding information about UFOs, and "it is important that due caution be exercised to avoid creating the impression that DND is 'hiding or concealing something.'" 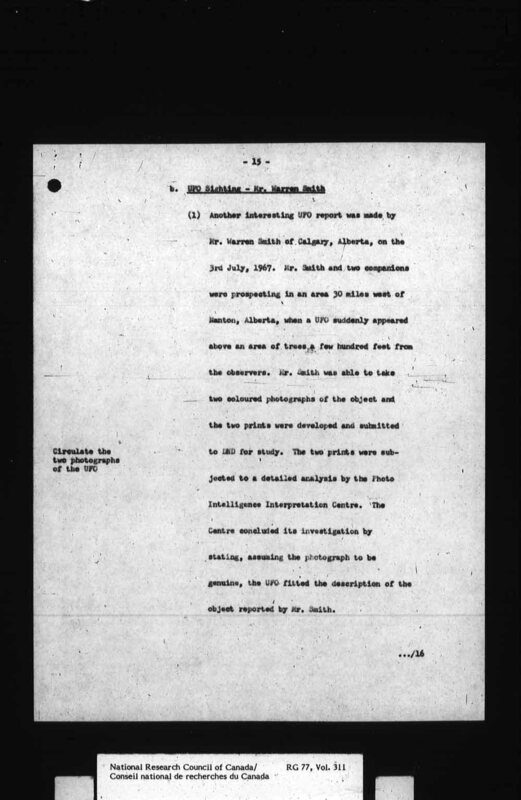 Robertson noted that certain documents would be protected from release, but "the release of other than classified material would be in the interest of the general public." Roberston realized that being forthcoming and cooperative with the public (i.e. media) about UFOs would be a good public relations tactic. The advantage of such a policy was that it would "provide a public service and to further the scientific and objective research into UFOs." If only other governments (or even current versions of the government) would adopt such a policy. 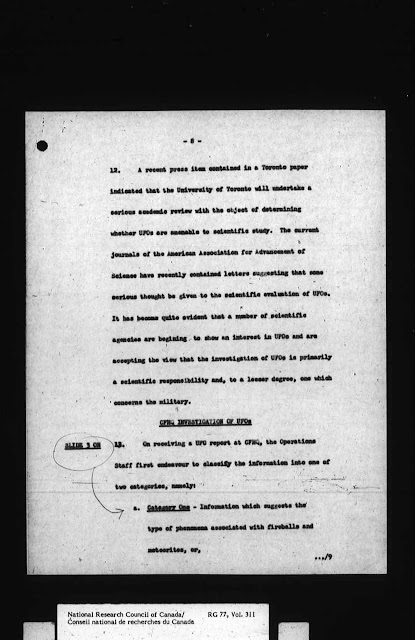 Robertson's recommendations were based on practical considerations regarding UFO sightings. 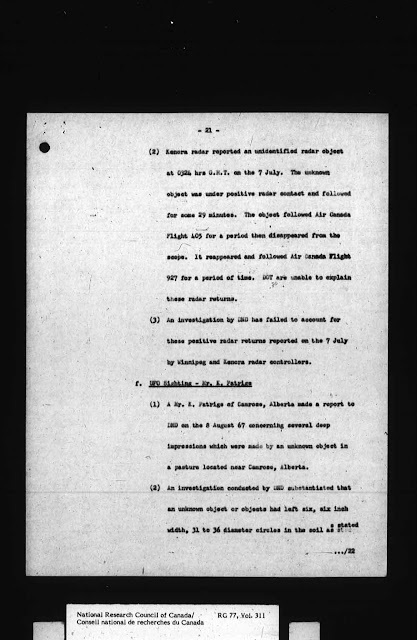 "The marked increase in the Air Section (RCAF) administrative workload which is directed towards actioning UFO reports is reaching a stage which is considered detrimental to the primary operational responsibilities and duties of the section." In other words, those pesky flying things (PFTs) were interfering with the more important day-to-day operations of the Air Force. "It is important to stress at this point, that the Director of Operations has neither the qualified technical staff, the established strength, nor the necessary scientific assistance required to conduct an objective type investigation into UFO reports." UFOs, therefore, were viewed as a scientific problem, unrelated to terrestrial military activity. 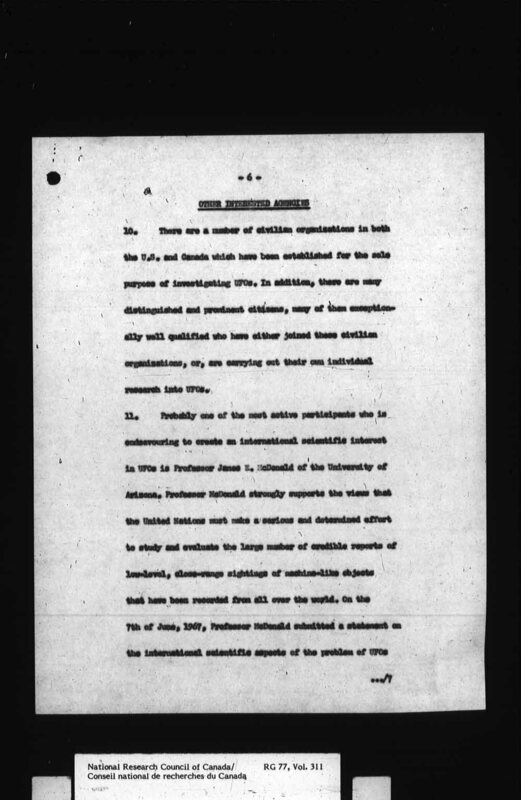 However: "... the primary interest of UFOs lies in the field of science, and to a lesser degree, to one that is associated with national security." So while the Air Force had an interest in UFO because of a potential security threat, the subject was placed directly into the lap of the scientific establishment (which didn't want it either). Although bounced to the NRC, DND "must be willing to assist in such areas as field investigations." 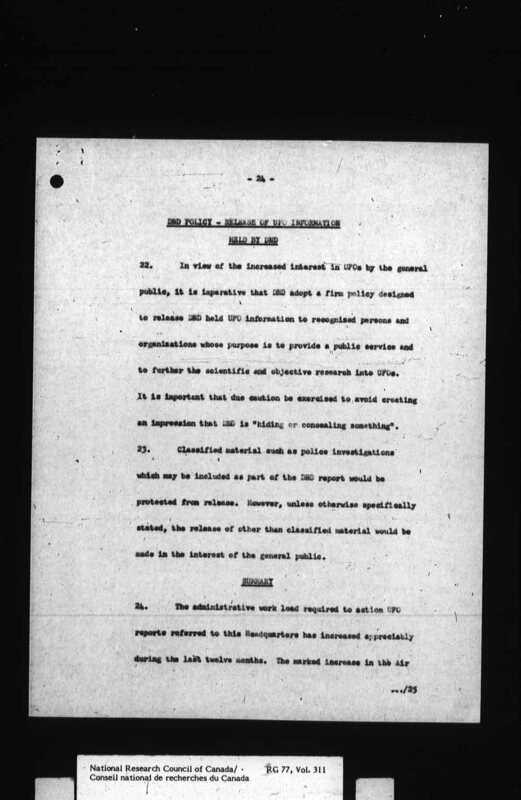 That ensured that should anything involving actual national security was discovered, DND would still have jurisdiction. The Roberston Briefing was presented in 1967 as a way to move responsibility for UFO reports away from the Canadian military and into Canada's scientific establishment. One can surmise that a similar discussion took place within the American military at one point as well. 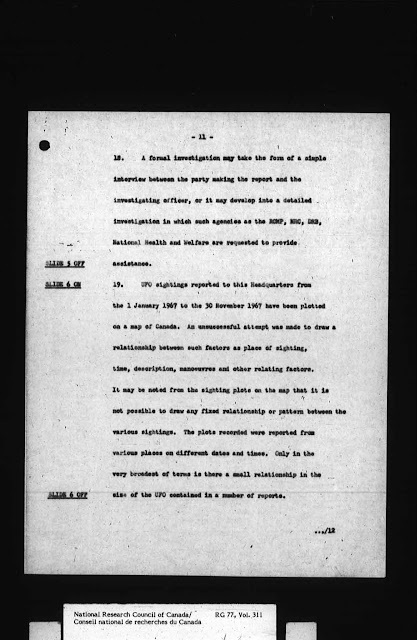 What is most interesting about the Roberston Briefing is that it contained details of a handful of fascinating UFO cases that occurred during a few months in 1967, all of which involved physical evidence and were unexplained by DND. In fact, several took place within a radius of only about 100 kilometres, centred on Falcon Lake, Manitoba. Is this Canada's "UFO Hotspot?" And since these unexplained cases involved physical evidence, reputable and highly trained witnesses, and even military and police investigations, these were the kind of cases that would have challenged the scientific community and demanded further attention.